To those who follow the Israeli-Palestinian conflict closely, the prospects for a two-state solution have never seemed dimmer. So why does veteran peacenik Uri Avnery remain so hopeful? EDITOR’S NOTE: August 20, 2018: Israeli peace activist, journalist, and former Knesset Member Uri Avnery died on Monday at the age of 94. One of the first Israelis to call for a Palestinian state and the first to meet with PLO leader Yasir Arafat, Avnery never wavered in his belief in two states for two peoples, living side by side in peace. Eyal Press wrote this profile in 2007. On a steamy summer day in 1982, an Israeli journalist named Uri Avnery rode in an armored Mercedes through a maze of streets in Beirut. The air was full of tension–Israel had just invaded Lebanon, and for several weeks the skies above the country’s war-torn capital had been streaked with fighter planes. The Mercedes pulled to a stop in front of an elegant apartment building in the western half of the city, where a cluster of bodyguards escorted Avnery inside. A short while later, a small man dressed in khaki military fatigues and a matching cap appeared. It was Yasir Arafat, chairman of the Palestine Liberation Organization, meeting face to face with an Israeli for the first time. This is not how Avnery is described by many Israelis, who, if they’ve heard of him, would more likely tell you this so-called man of peace has done nothing but stir up trouble all his life. Avnery might not deny the charge. “I was never a quiet man,” he once remarked to a documentary filmmaker. That’s putting it mildly. In 1950 Avnery began publishing an irreverent newsweekly, Haolam Hazeh (“This World”), which so inflamed the country’s ruling elite that Isser Harel, chief of Israel’s secret service at the time, wrote that Avnery was “Public Enemy Number 1” in the eyes of the Zionist establishment. On several occasions Haolam Hazeh‘s offices were bombed by unknown assailants; Avnery was set upon by thugs who bloodied his face and broke his arms in an apparent effort to silence him. It didn’t work. In 1965 Avnery launched and won a maverick campaign for a seat in the Knesset, where he served for the next eight years as the often-lonely champion of an array of radical causes: full equality for Arab citizens, the disestablishment of religion, the creation of a Palestinian state in the territories Israel occupied in 1967. And yet there is no denying that, perhaps more than ever, Avnery is a man radically out of step with the mood in his country: an unwavering optimist who still believes peace will come and who remains resolutely convinced the vision he laid out to Arafat in 1982 will come to pass. During the mid-1990s, when the Oslo peace process still looked promising, resistance to this notion emanated almost exclusively from the Israeli right. Today, mention of the two-state solution elicits nearly as much skepticism on the center and the left. The failed Camp David summit in 2000, the eruption of the second intifada later that year, the violent fragmentation of the Palestinian movement this past June–all this has turned many formerly avid supporters of peace into disillusioned cynics. A recent survey found that nearly two-thirds of Israelis no longer believe negotiations will lead to a settlement anytime soon. On the moderate left, an increasingly common view is that, with the Islamist Hamas movement in charge of Gaza and a wellspring of hatred and mistrust on both sides, the best that can be hoped for is to manage the conflict. Many radical critics believe Israel’s annexation of growing swaths of the West Bank has rendered the two-state solution obsolete–and that activists should instead call for one state in which Jews and Arabs live together on equal terms. Avnery is aware that hope is fading–“Yes, around us there’s a gathering despair, more than ever,” he admits–but he remains unflaggingly upbeat. It’s hard not to see an element of tragedy in this–and, perhaps, denial. At a time when a quarter of a million Israelis live in the West Bank, when Palestinians are bitterly divided, when many Israelis have become inured to the daily outrages of the occupation and no outside pressure for a just settlement can be expected from the United States, why does Avnery remain optimistic? Why does he believe that the warring factions in what seems increasingly like the world’s most intractable conflict can learn to put aside their grievances? Avnery’s right-wing detractors would likely say it’s because he hasn’t come to grips with the depth of animosity the Arab world harbors toward Zionism, a hostility he and much of the left are often accused of sharing. It’s true that some radical critics of Israel believe the world would be a better place had Zionism never come to fruition. But Avnery isn’t one of them, for reasons as much personal as political. Born in Beckhum, Germany, in 1923, he grew up in an affluent neighborhood in the northern city of Hanover. His father, Alfred, was a successful banker. He was also a Zionist. In 1933, the year Avnery turned 10 and Hitler became chancellor, the family packed up their belongings and fled to Palestine. The decision proved financially ruinous–Avnery’s parents soon found themselves toiling in a Tel Aviv laundromat–but there were few regrets. “Zionism saved our lives–practically, literally,” Avnery told me recently. That some now view it as a sordid colonialist enterprise, forgetting the desperation that drove Jews like his father to yearn for a homeland, reflects historical amnesia, he went on to say, though Avnery blamed this as much on Zionism’s uncritical apologists as on its contemporary critics. “It’s a shame. I’m sorry about it, because it shows that the history of Zionism has been killed by the denial of what Zionism has done to the Palestinians,” he said. The experience of taking part in a nationalist struggle against an imperial power would eventually lead Avnery to view Palestinian rebels as a mirror image of his younger self. Meanwhile, proud Jewish patriot that he was, Avnery served in a commando unit during the 1948 war, an experience he chronicled in a book, In the Fields of the Philistines, that became a surprise bestseller, earning its author his first taste of fame. The book was embraced by readers yearning for tales of glory after a brutal war, but Avnery, who was seriously wounded in the fighting, intended it as a cautionary tale about the sacrifices endured by ordinary soldiers, with whom he strongly identified. When he realized this was not how it was received, he penned a sequel describing a less heroic side of the war, including atrocities perpetrated against Palestinians, which fared less well–the Israeli government blocked its publication. It was his first taste of infamy. Shortly thereafter, Avnery and some friends purchased a moribund family magazine and launched Haolam Hazeh, which did little to endear him to those who might have begun to question his loyalty. A cross between I.F. Stone’s Weekly and Paris Match, the magazine featured an entertaining and incendiary mix of hard-hitting exposés, radical commentary, salacious gossip items and (gracing the back cover) photos of half-naked women, a format Avnery shrewdly recognized would boost circulation. Since most Israeli newspapers of that time functioned as servile (and largely colorless) mouthpieces for the various political parties they represented, Haolam Hazeh amounted to the journalistic equivalent of a Molotov cocktail hurled at the Israeli elite and was treated as such. Prime Minister David Ben-Gurion referred to it derisively as that “certain paper.” Ministers feared appearing in its pages, not least because the magazine’s popularity gave its publisher an influential platform for a bracingly unorthodox political agenda. Haolam Hazeh attacked the Israeli religious establishment. It called for an end to martial law in Arab villages inside Israel (which wasn’t lifted until 1966). It introduced readers to a phrase that had never before appeared in an Israeli paper: “the Palestinian people.” And it published in-depth accounts of incidents such as the 1953 massacre in Qibya, a village in the Jordanian-occupied West Bank, where sixty-nine civilians were killed in a brutal retaliatory raid carried out by Unit 101, whose commander was a young reserve major named Ariel Sharon. It was after this that Avnery was beaten up by goons. It is hard to appreciate how “unbelievably subversive” all this was in the Israel of the 1950s and ’60s, says Tom Segev, who remembers the thrill of stealing off to a kiosk as a teenager to buy Haolam Hazeh. Though it indulged in its share of sensationalism, the paper also pioneered a new style of Israeli journalism–bold headlines, short punchy sentences–and glamorized a new culture centered on the shops and cafes sprouting up in Tel Aviv, where Avnery made his home and where, today, his vision has clearly triumphed. The sushi bars, the discos, the trendy neighborhoods lined with bistros, tattoo parlors and art galleries: all this would have shocked Israel’s austere, kibbutz-reared socialist founders. Avnery “celebrated it before it existed,” says Segev. “He invented it.” With his long hair, dramatic beard and maverick opinions, he also became a minor celebrity: the freewheeling iconoclast who rode around town in a gleaming Mustang convertible and relished stirring up controversy. These days, Avnery is more of a celebrity in Europe–where he has collected a shelf full of humanitarian prizes over the past decade, including the 2001 Right Livelihood Award (often dubbed the alternative Nobel Peace Prize)–than in his own country, where he has grown increasingly isolated. This is to some extent a product of personality. Though he has often longed to spearhead a movement, Avnery is by nature a loner, a “one-man show,” as one activist put it, whom even his admirers describe as cold. When I visited him during the summer at his home in Tel Aviv, a tidy apartment decorated with Persian rugs, paintings, fresh flowers and, in one corner, a bust of Avnery himself, he offered me a glass of water and a stiff handshake. His blue eyes radiated seriousness but little trace of warmth. There was no sign of his wife, Rachel, a photographer who has been at his side for more than fifty years. Perhaps I should have expected as much: in a 2002 documentary about Avnery by filmmaker Yair Lev, Rachel let slip that Uri has never told her that he loves her. “I don’t like saying silly things,” he explained stonily, as she shot him a wounded glare. He then turned on a handheld radio to tune out the conversation. What brings out Avnery’s passion is politics, for which his appetite appears unlimited, and history, on which he craves to leave a mark. Avnery still writes a weekly column that is translated into several languages and distributed by e-mail to a potentially wider audience than Haolam Hazeh ever reached. Strewn with historical analogies and infused with polemical verve, the columns are witty, abrasive and a marvel for the sheer mental acuity they display. But few young Israelis, and even fewer people in positions of authority, read them. Gush Shalom, the organization Avnery founded in 1993, operates on a shoestring, with nothing approaching a mass following, especially lately. In June it rallied supporters for a protest on the fortieth anniversary of Israel’s occupation. A mere 5,000 people showed up. As the years wore on, however, and Israel’s occupation grew more entrenched, Avnery’s focus narrowed. Meanwhile, the establishment was toppled, not by Avnery but by right-wing supporters of a Greater Israel, the kind of people who adore the current front-runner in polls forecasting who will become the next prime minister, Benjamin Netanyahu, a man almost universally reviled on the left. Why, then, the unflagging optimism? “First of all, I’m an optimist by birth,” Avnery said as we sat down in his living room. “I’m a genetic optimist–my father was an optimist, my grandfather was an optimist.” Avnery added that age might lend him a sense of perspective others lack. “Look, when I and a small group of people put forward the idea of a two-state solution immediately after the war of 1948, it would have been a wild exaggeration to say there were 100 people who advocated this. Today, it is the worldwide consensus. To those who’ve tracked the news from Israel lately, Avnery’s self-assurance on this score might seem mildly delusional. Yet surveys indicate that roughly two-thirds of Israelis, and a comparable percentage of Palestinians, still support a two-state settlement of the conflict. Of course, this hardly means it will happen. Galia Golan, a political scientist and longtime veteran of Peace Now, believes that in Israel, “what’s happened is not that people moved to the right but that they lost hope. People just aren’t interested because they don’t believe anything can happen. The government in Israel is weak. The Palestinians, of course, are split. Any way you look at it, it leaves you in a dead end.” Hanging on the wall behind Golan’s desk in Herzliya, where she teaches, is a poster of a Tel Aviv peace rally in 1995, at the height of the Oslo period. The crowd was estimated at a quarter-million. Golan was there and remembers the event well: it was the rally at which Yitzhak Rabin spoke for the last time, before a Jewish settler named Yigal Amir assassinated him to prevent the possibility of a withdrawal from the territories. Today, the debate about Oslo is almost moot: the question preoccupying Israeli peace advocates is not whether the agreement could have worked but what to do in light of the Hamas takeover of Gaza. The Israeli government is trying desperately to prop up Fatah in the West Bank. Avnery believes the strategy is bound to fail and that the government will eventually have to reach out to Hamas, something he’s already done himself, meeting in person with several members of the party whom Israel has since imprisoned. Many Israelis regard such activity as borderline traitorous. Avnery is familiar with the charge. In the 1970s, he helped launch the Council for Israeli-Palestinian Peace, which began arranging secret meetings with the PLO, then considered beyond the pale. The venture contained a certain irony, since in the 1960s Avnery himself had dismissed the members of Fatah as “terrorists.” A decade later he was dashing off letters to Arafat. After their dramatic 1982 encounter in Beirut, a PLO spokesman announced that the meeting had occurred. As he drove home to Israel, Avnery heard on the radio no fewer than four Israeli ministers denounce him for treason. All four, he says, later met with Arafat themselves. History, Avnery believes, will likely repeat itself. It’s a controversial view–even on the left, there are people who doubt a compromise can be reached with Hamas, which cites The Protocols of the Elders of Zion approvingly in its founding charter and holds all of Palestine to be a sacred Islamic trust. Many Palestinian leaders have written off working with Hamas as well. Avnery, a staunch secularist, clearly finds Hamas’s worldview off-putting but notes that some of its leaders have indicated willingness to stop fighting Israel if it withdraws to the 1967 lines. He also believes it is not Israel’s job to choose the Palestinian representatives, particularly after it ruthlessly undermined Fatah when Arafat was alive. Some would argue that Arafat himself did a fine job of damaging Fatah by lining the pockets of his deputies while allowing key institutions to decay. Not Avnery, who is rarely at a loss for damning things to say about Israeli leaders (Shimon Peres–“a man without principle”; Ehud Barak–“a megalomaniac”) yet seems incapable of mustering a critical thought about the former PLO chairman. Arafat possessed a “genius” for preventing the strands of his movement from unraveling, Avnery told me. But wasn’t he also authoritarian and corrupt? “It’s irrelevant,” he said. Propped up on a shelf in Avnery’s apartment were no fewer than three photos of Arafat, a fondness many find curious. “Where is the criticism he educated us on?” asked Segev, who on several occasions tagged along on visits to see Arafat that Avnery helped to arrange. The excursions had the feel of official tributes paid to the Great Leader in a totalitarian state, Segev said. When he asked Arafat a question one time about human rights abuses carried out by his security services, eyebrows were raised, as though he’d committed an inexcusable faux pas. The most powerful argument against the two-state solution can be found not in the statements of Hamas hardliners but in the facts on the ground that Israeli settlers have been creating for decades, with no pause to see how negotiations might fare. One morning last summer I traveled through the West Bank with Dror Etkes, a researcher formerly with Peace Now who earlier this year published a report showing that 90 percent of Israeli settlements sprawl beyond their official boundaries. We drove north in his battered pickup truck along a bypass road in the direction of Psagot, a hilltop settlement that overlooks Ramallah. Etkes pulled over. “See that?” he said. Scattered atop a hill in the near distance were a bunch of makeshift trailers and antennas. It was an illegal settlement outpost, built on privately owned Palestinian land. The Israeli government has vowed to block such outposts, but those vows have acquired an increasingly hollow ring. “A classic land grab,” said Etkes. Later, along a rutted road slicing through an otherwise isolated stretch of terrain, we came upon a cluster of concrete bungalows next to an open field enclosed by razor wire. The land was uninhabited, but it had been fenced off for a reason: to reserve space for more housing once capacity in the nearby settlement is reached. It is hard to find an Israeli these days whose confidence in the peace process was not shaken by the wave of suicide bombings that struck the country several years ago. It is equally difficult to find a Palestinian whose faith has not been eroded by the inexorable expansion of the settlements. There were 130,000 settlers in the West Bank in 1993, the year of the famous handshake between Rabin and Arafat. There are 270,000 today. “Israeli governments used Oslo in order to change, dramatically and irreversibly, the geography of the West Bank,” Etkes said. In 2000, the year Ehud Barak blamed Arafat alone for Camp David’s failure–a spurious claim that quickly became holy writ among many American commentators–construction began on 4,000 housing units in the West Bank, according to Etkes. This was the highest number since the Oslo agreement was signed. The settlements, the bypass roads, the security checkpoints built like international border crossings, the massive 270-mile separation wall–all this has acquired an air of permanence that some view as grounds for a paradigm shift. At a debate last May in Tel Aviv, historian Ilan Pappé, a radical critic of Zionism, declared, “The real two-states formula is the one which we see being implemented in front of our eyes: half the West Bank annexed to Israel, and the other half as a Bantustan surrounded by walls and fences but allowed to fly a Palestinian flag.” The time has come for the peace movement to call for turning Israel and Palestine into one democratic state, he argued. Pappé’s opponent was Avnery, who was having none of it. 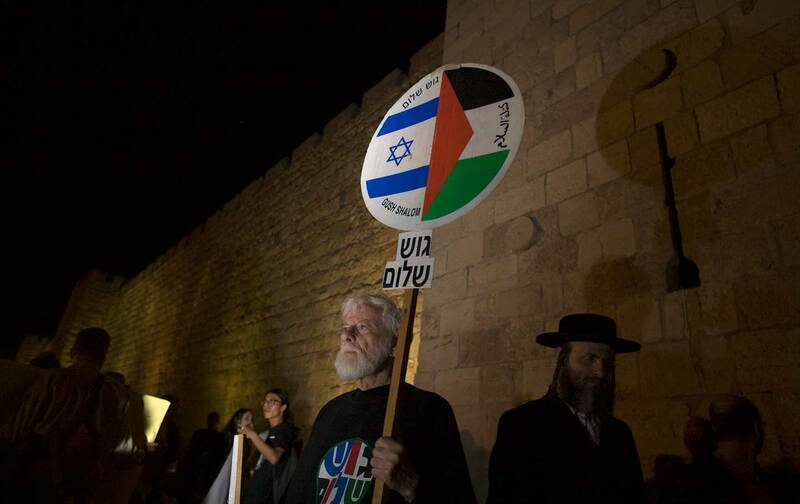 “It is far easier to dismantle a settlement, to dismantle settlements, to dismantle all the settlements–far easier than to force 6 million Jewish Israelis to dismantle their state,” Avnery countered. The problem with the one-state solution is that “nobody wants it except a few intellectuals,” Avnery told me. And who exactly will dismantle the growing archipelago of settlements? “Sharon, with all his faults, has shown that it can be done,” Avnery insisted. He was referring to Israel’s 2005 withdrawal from Gaza, which did not spark as fierce an opposition as many had anticipated. But what has happened since has hardly bolstered prospects for peace. The fact that Gaza is now ruled by Hamas and that the Israeli border town of Sderot has come under steady rocket fire has played into the hands of those who warn that even worse chaos will erupt should Israel withdraw from the West Bank. Even a popular Israeli leader would likely balk at such a step. Israel’s prime minister, Ehud Olmert, is deeply unpopular, and the man waiting in the wings, Netanyahu, is about as likely to end the occupation as George W. Bush is to lead the call for pulling US troops out of Iraq. Avnery is not without worries of his own. In a book published forty years ago, he wrote that “without a policy aimed at securing acceptance by the peoples in the region, any security [for Israel] could only be temporary.” Today, instead of seeking acceptance, Israel is erecting walls, and all around it Islamic movements are gathering strength. Avnery admitted to viewing the latter development “with trepidation.” But he has also lived long enough to know that walls built to divide people can be torn down. One morning in early September, he made his way to Liberty Bell Garden, in Jerusalem, for a small victory celebration. Earlier in the week, the Israeli High Court of Justice had ruled that a mile-long stretch of Israel’s separation barrier must be rerouted, since its sole purpose had been to accommodate a future Jewish settlement. The case had been brought before the court on behalf of the residents of Bil’in, a West Bank village where both Jewish and Palestinian activists had been staging weekly protests, several of which Avnery attended.